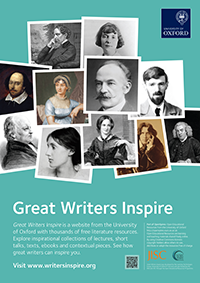 Great Writers Inspire is a project which is making a substantial collection of literary themed learning resources available for global reuse. Thousands of resources are available through the site, including audio and video lectures and short talks, downloadable electronic texts and ebooks, and background contextual resources. 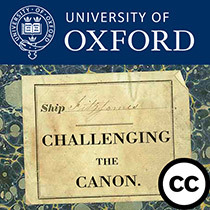 Many of these resources have been specially created by the University of Oxford for this website. For more information about the project please read the Frequently Asked Questions. Many of the resources have been grouped into collections by Writer or Theme. More inspiration can be found by exploring the Approaches to Literature section or by following one of our Tours: History of our Literature or Women's Writing. This website is an Online Educational Resource (OER), meaning that everything on here is released under a licence that allows you to reuse them worldwide whether you are a student, teacher, life-long learner or resource creator. All the resources on the site are either in the public domain or made available under a Creative Commons licence. This means you may share or adapt the work providing you attribute it, do not use it for financial gain, and share any resulting work under similar conditions. You can read more about the Creative Commons licences at http://creativecommons.org/licenses/. This website has been developed by a team of specialists from the University of Oxford. Members of the Faculty of English Language and Literature have created new resources, and curated existing ones to make them available for you. You can find out more about the academics behind this project by following the 'Researcher' links on the various pages, or by browsing our Researchers page. 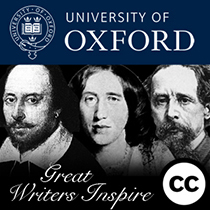 The Great Writers Inspire project is run by the Educational Media Services team within Academic IT Services in collaboration with the Faculty of English Language and Literature at the University of Oxford. The principal investigator was Peter Robinson and the project was funded by the Higher Education Academy and JISC through the 2012 Open Educational Resources Programme. In 2017 a new project called Postcolonial Writers Make Worlds, sparked by Great Writers Inspire, was established to feature a number of contemporary Black and Asian British authors within the category of ‘great writers’. The Great Writers Inspire at Home workshop series that ran over summer 2017 brought great writers of our time into conversation with their readers, and the resulting website, Writers Make Worlds, is now an online hub for teaching and learning resources on this inspiring literature. We are always interested to hear how the Great Writers Inspire website, blog and resources are used and to make contact with colleagues who are involved in creating or using open educational resources. To contact us, please email podcasts@it.ox.ac.uk. See the 'Visiting IT Services' page for maps and further information about how to find us.